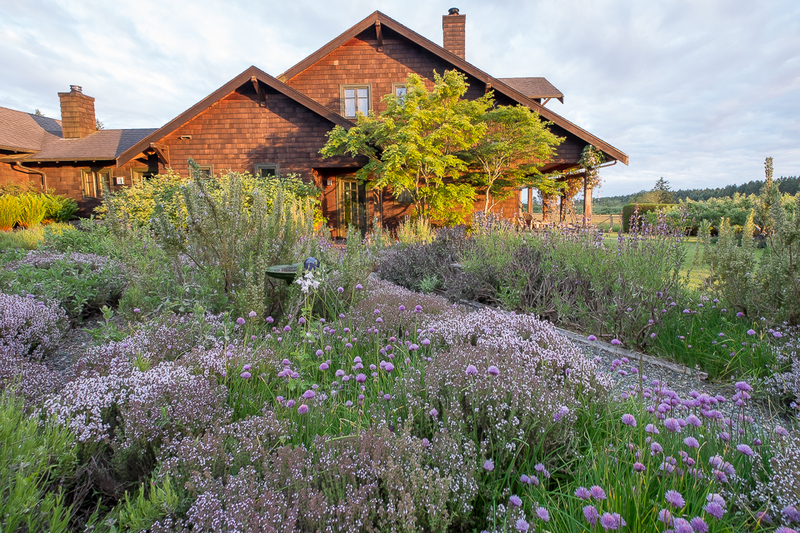 The sage, thyme, rosemary and lavender that make up the bulk of our front entry herb garden are getting old, ancient even. Seventeen years ago when I was planning this twenty-by-forty foot herb garden, books I read noted that perennial herbs would eventually need to be replaced. 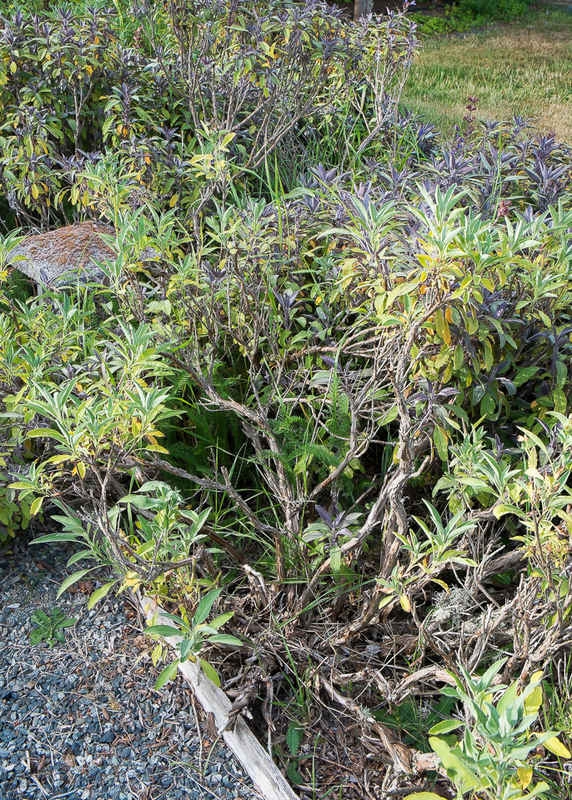 According to the Rodale Herb Book (1974) sage “should not be allowed to outlive three or four years because of the tendency of its stems to become woody and tough.” Not only the sage but also almost all the other herbs in this garden are definitely at the woody stage and probably should have been replaced several times over. But each July after they finish their lovely May and June bloom, I begin shearing them back, finding new growth despite the matted and woody stems and branches, and decide I can put off replacing them for one more year. The idea of starting over is so daunting. There are the tasks of starting and growing new plants, pulling out the old ones along with the dandelions, vetch and other persistent weeds, renewing the soil, updating irritation lines, replanting, possibly with a new design and then ending up with a garden of smallish new plants, a disappointing contrast to the lively tangle of overgrown plants that characterizes the herb garden now. Surely there is something else I could be doing. 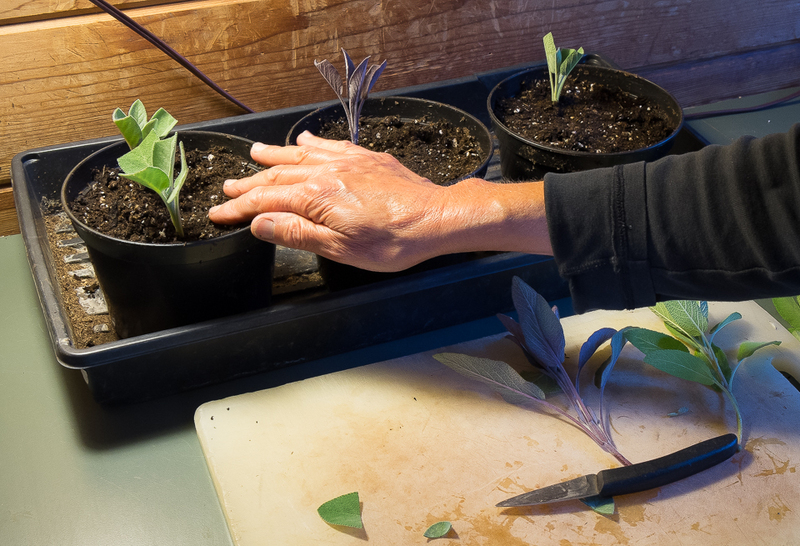 I’d have put off doing anything for yet another year if my friend Carol hadn’t told me how easy it is to propagate plants from cuttings. She lent me her copy of the American Horticultural Society’s Plant Propagation manual and suggested I also look online at how-to videos. Encouraged, I found an excellent UTube video by Tim Rumball, editor of Amateur Gardening Weekly, a British gardening magazine. The process did look pretty easy. And the rest of the steps involved in renewing the herb garden? Well, I could put those off until fall or winter. 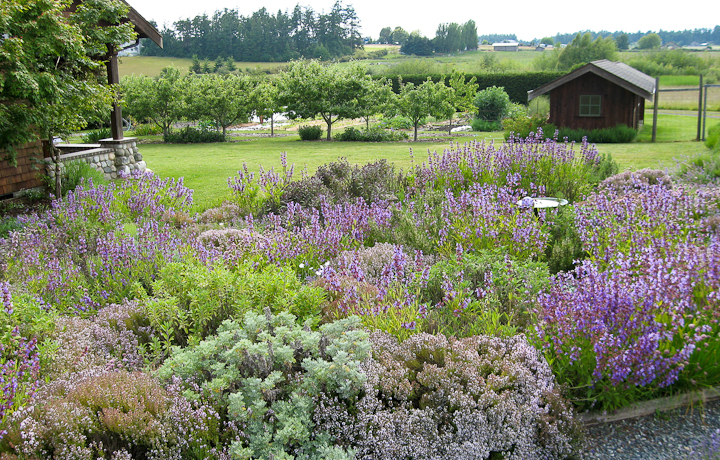 And perhaps tackle only one of the three long beds that make up the herb garden. Following the steps in Rumball’s video, I cut six-inch branches of several sage varieties, removed the lower leaves with a sharp knife, sliced off the top half of the remaining leaves, firmed these stems into pots of my regular potting soil, topped the soil with a layer of quick-draining material, perlite because that’s what I had though Rumball used horticultural gravel, watered the pots well and pushed in sticks around the edges of the pots to hold the plastic bag propagation tents away from the leaves. They are in a warm, shady spot in my seed starting room where I’ll check them regularly for roots emerging from the bottom of the pot. 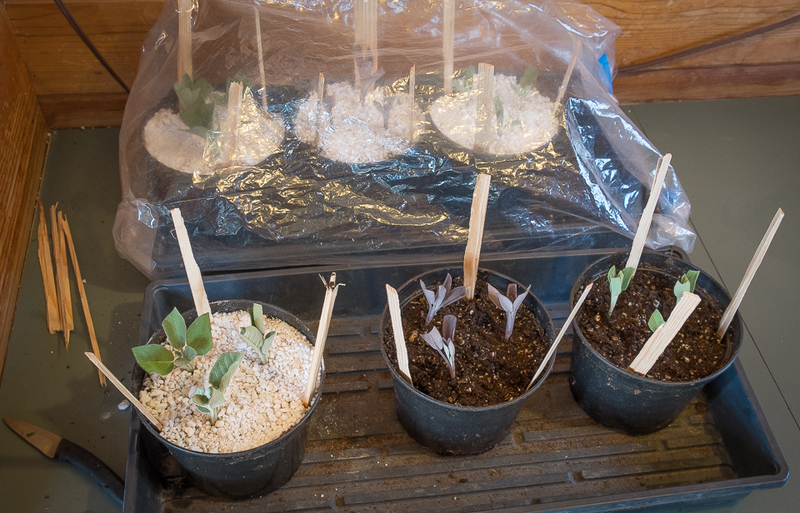 In six to eight weeks, I hope to be transplanting new sage plants to individual pots. 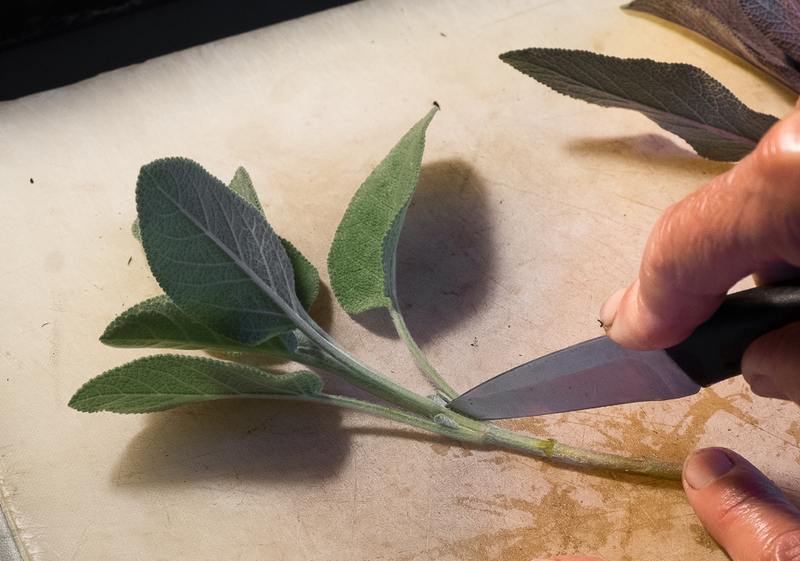 I took cuttings from three favorite varieties of sage that have been growing robustly since the first years of the herb garden. 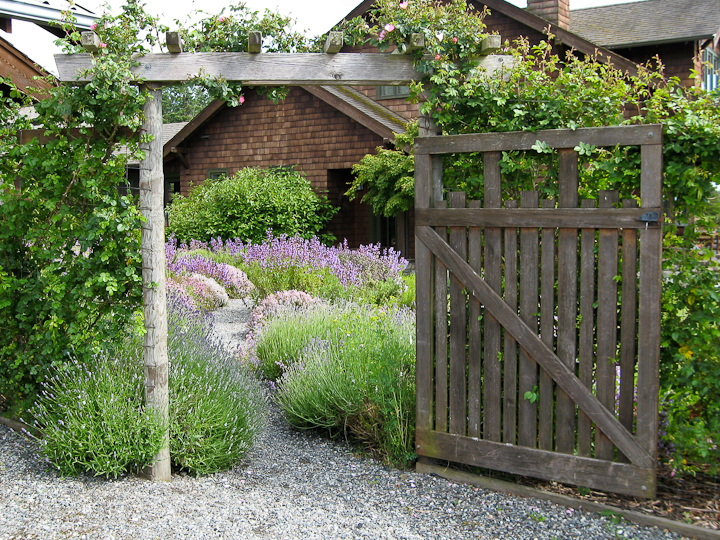 ‘Bergartten’, a rounded-leafed, gray/green sage with a mounding habit and light blue blooms recommended by Jim Wilson in Landscaping with Herbs (1994); purple sage whose leaves contrast wonderfully with the softer greens of other sage; and an unnamed sage variety my neighbor Frances gave me when I began the garden. Frances explained that a gardener friend “from a fancy estate” gave it to her and told her it was special. 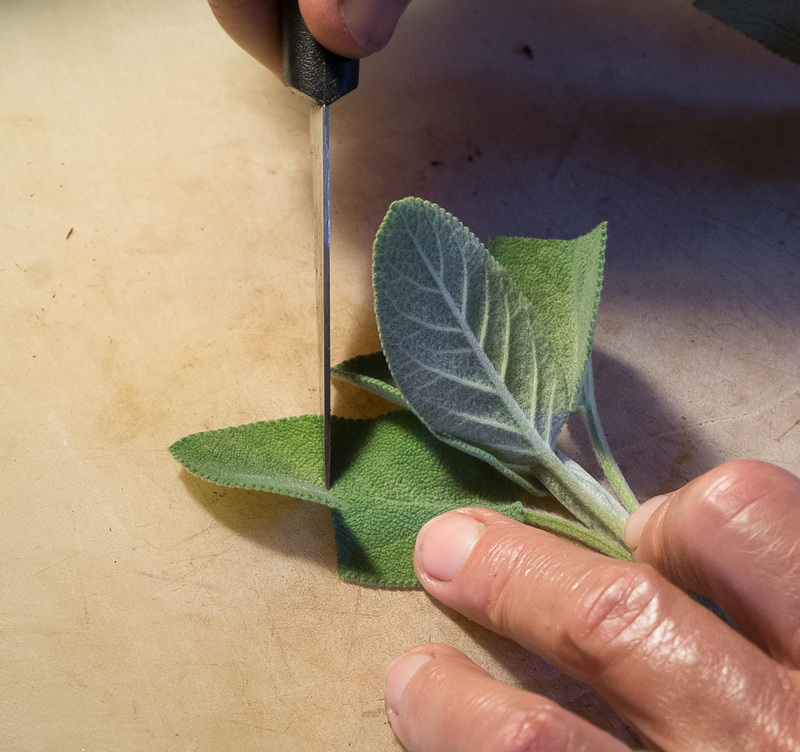 It is a lovely sage with pointed light green leaves like culinary sage but more modest light blue blooms that hold longer than the robust purple blooms of ordinary culinary sage. If these cuttings thrive, I’ll take cuttings from the rosemary, lavender and thyme in the weeks ahead. Inspired by these first steps, I’ve pulled from the shelf the herb garden books I used to begin this garden, reviewing both herb varieties I’d underlined and noticing design ideas. The process of renewing this garden is starting to seem less daunting and more fun. And what better way to spend a warm summer afternoon on the terrace than with garden books and daydreams about new gardens.